This beautiful vacation residence with two bedrooms and two bathrooms can comfortably accommodate a family of six. 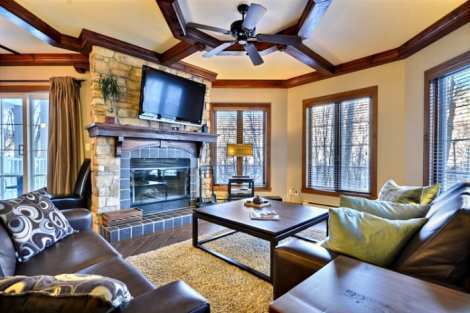 A cozy atmosphere is created in this pleasant vacation residence by the wood accents, wood-burning fireplace and heated tile floors. An abundance of windows let light in and look out onto a beautiful natural landscape. The open-concept main room is perfect for gathering guests around a great meal or relaxing and sharing the day’s highlights. The well-equipped kitchen lets you cook like you would at home. The dining room opens onto a balcony equipped with barbecue in summer. The master bedroom, with adjacent full bathroom, is furnished with a king-size bed, dressers and a TV with DVD player. The cozy second bedroom has a queen-size bed and flat-screen TV. Other conveniences offered to guests include wireless high-speed internet access and a giant-screen TV with DVD player in the living room. We had a great experience and would return. The only negatives were there were some crumbs underneath our couch missed by housekeeping, and water was running from the 'faucet' in the bathroom. Other than that everything was excellent. Loved the fact that we didn't have to go back for check out and that it was done at distance to lock the door. We stayed at Les Manoirs for our weekend getaway. We were very satisfied with the service and our accommodation. How ever we find the deposit fee quite steep considering it is 3x the price we paid for our condo. Les Manoirs' location was perfect, it was a 10 minutes walk to the Village where we had access to our free activities included with our reservation. Staff was friendly and helpful, allowed us a late check out so there was no rush for us to clean up and pack in the morning. Will definitely book with Sunstar in the future.